This is my simple version of Outback Steakhouse’s Alice Springs Chicken except without mushrooms. 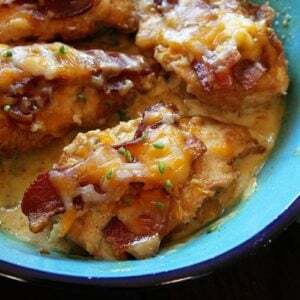 Cheesy Bacon Chicken with a seriously amazing homemade Honey Mustard sauce is a dinnertime winner! Place chicken breasts on a large plate or small baking dish. Pour 2/3 of the marinade over the chicken. Cover with plastic wrap and place in fridge for at least 2 hours. When you are ready to prepare the chicken, preheat the oven to 375° F.
Brush each seared chicken breast with a little of the reserved honey mustard marinade, being sure to save a little extra that you can serve on the side later with the dish.